The eye of the tiger shines upon us—finally | Where to next? The last couple of days have been all about tigers. In less than two weeks, we have visited three national parks in India—Pench, Kanha and Panna—and done eight safari drives, including one that lasted almost six hours. But the tigers eluded us. 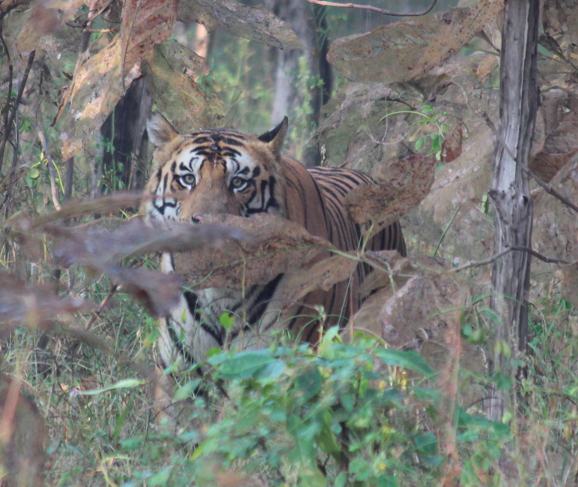 We got a glimpse of one in Kanha. An army of Gypsies (the local safari vehicles) descended upon a leafy stretch of road near where a mum and three cubs were supposedly relaxing in the scrub. One cub ventured close enough to the road to peek through the bushes and inspect the fuss. I got a quick pic that looks about as much like a tiger as a monarch butterfly. So we pretty much agreed that this wouldn’t count as a true sighting unless we never saw another. But then we got to Panna National Park with its remarkable story of taking its tiger population from zero to a healthy count of 24 in just over four years. Created in 1981 and declared a tiger reserve in 1994, Panna was declared devoid of tigers in February 2009. Anand explained how this came to be. Poachers were active and far too successful in Panna for many years prior to 2009. In fact, the population was most likely depleted by 2007. But Panna’s forest officials (who were in on the poaching scheme) had plaster casts of tiger footprints (known as pug marks), and used these to fool higher authorities into believing that tigers still roamed the park. Finally, an expert on tigers was called in to assess the situation. He did camera-trap studies and other research and issued a verdict of ‘no tigers in Panna’. Local park authorities were outraged and filed a lawsuit against the expert for making false claims. 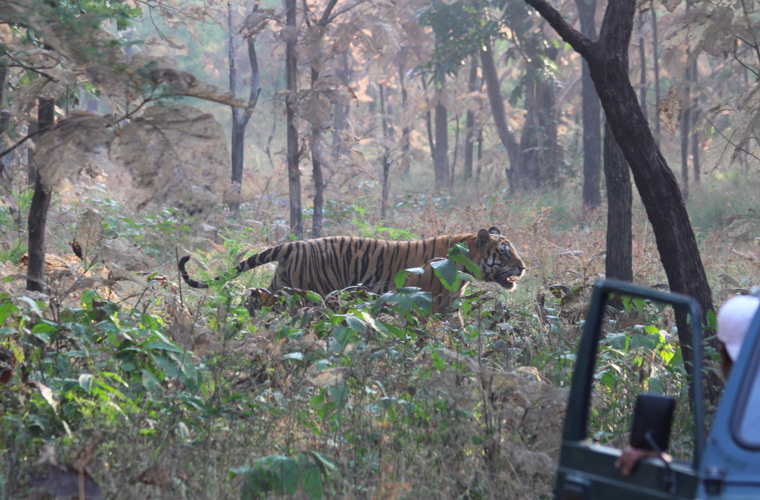 But the National Tiger Conservation Authority trusted the comprehensive research and verdict, and acted to rescue Panna. 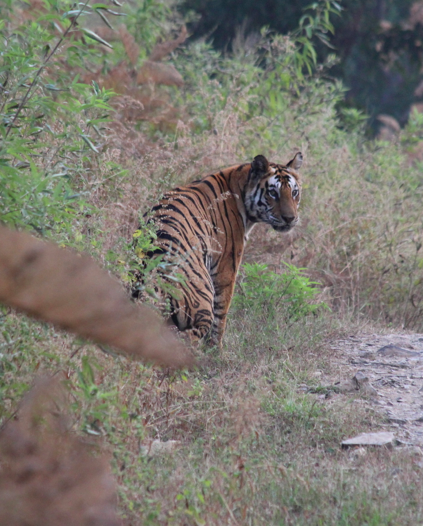 Some of the corrupt officials were suspended, others went to jail, and a long process began to return tigers to Panna. 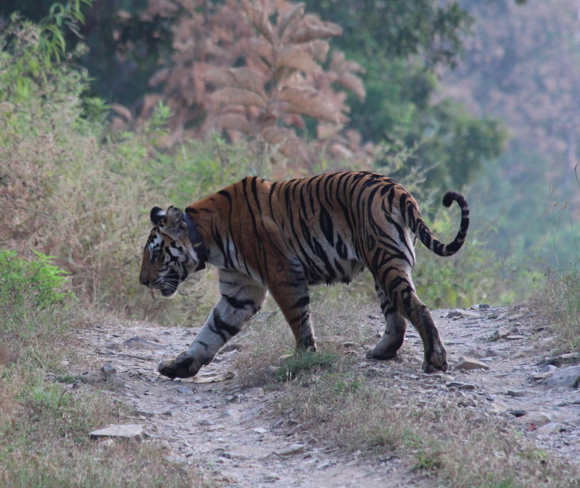 In March 2009, two females (T1 and T2) from Bhandhavgarh and Kanha, respectively, were relocated to the reserve. A Tiger Reintroduction Project plan was developed that called for a total of four females and two males to be moved to Panna. There was an instant and unexpected challenge when, for the first time ever known in history, a male tiger displayed homing instincts and left the park to head toward his home territory of Pench. 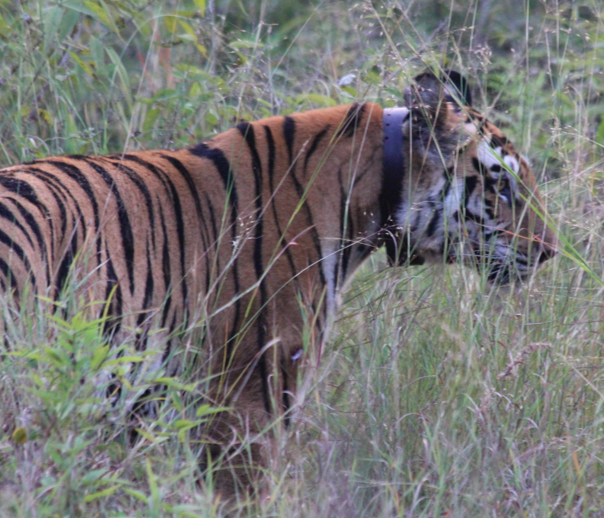 He had to be tracked (many of Panna’s tigers have monitoring collars) for 50 days to be protected and finally tranquilised, recaptured and returned to Panna, where he has since stayed put. Happy tiger ‘families’ have thrived since then. T1 had her first litter of four cubs in April 2010. A second litter arrived in early 2012. T2 also had two litters in that period of time. And the cubs keep coming. Which leads me to our tiger encounters. Can’t you people let a girl crap in private? It was about 4:30pm when we saw the flick of a tail heading though the grass in front of us. Damn, was that going to be as good as it got? But she (it was T1 herself) padded up the hill, turned right, ambled along the ridge and descended again behind us. She sniffed a bit, had a crap and a pee (nothing is private when you’re a tiger being stalked by people with cameras), and wandered into the bush on the other side of the road. She rummaged around and flopped down in the tall grass. Even though we could hardly see her, we watched spellbound, snapping photos and cherishing every moment of the 30 or so minutes we spent with her, even though our only good views were while she was on the road. We moved on only because the park was closing for the night and we had just under 30 minutes to get to the gate OR get in trouble. Next morning, we set out with the intention of going straight to the place where we’d seen T1 the day before. But alarm calls from a sambar deer and a couple of tiger growls were enough to send us, and all the other Gypsies full of gawkers, off in another direction. After 45–60 minutes of chasing sounds, there he was—one of T1’s offspring from her second litter. He glared at us from his hide in the grass. Suddenly he began to move and we’ll never know whether he was after prey or determined to have his morning crap in private. In a flash, he loped through the grass, across the road and disappeared into the brush. So now we’re counting all three tiger sightings, and we’re on our way to Ranthambore National Park in Rajasthan, with another four safari drives over the next couple of days. Look out tigers and leopards too! Why do they have names like T1 ? Cant they give them proper names? I think some of the parks have excellent control over poachers, others not quite so good. We had another safari drive this morning and saw very little. Fingers crossed that this afternoon’s expedition is better. But seriously, we’ve seen a lot and there are many more photos to come. Hi Peggy and John! I love your picture and knowing you enjoy your stay in India. Your pictures are really stunning, I’ve never seen wild tigers so near. We saw white tigers at the zoo in Mysore, How big they are! Impressive animals! Next time we will visit India we should really make safaris. Our problem is that we are both working, the children have school. We visited India during the carnival vacations; we got some additional “school days off” justifying these trips as “cultural trips”. Thanks so much. India really is a cultural trip, so I hope you find an excuse to return soon. G’day and GREAT photos Peggy, true! Yours and Poor John’s adventures…am still in awe of reading about too! So glad you are coming along for the ‘ride’. The more the merrier. We were thrilled and gobsmacked! What a very big surprise, to actually see Tigers CLOSE UP! And you also were able to get some very good photos as well. We hope to see a few more exciting wild animals photos…. keep up the good work. We were so pleased to have such a good view. People in other Gypsies had even better views, but I certainly have no complaints, just wonderful memories and photos. As always, another really good post about your adventures. As a cat person, I really enjoy seeing these photos of big cats. Thank you! You got some really great photos and I’m pleased that you and John are still having such a great time. So glad you enjoyed it. Stay tuned because there are lots more pics to come. They are such gorgeous animals. I hope we manage to see more. It’s my pleasure. Glad you are enjoying them. I added an explanation about linking in the comment on the wild dog post. Hope it helps. Let me know either way. Cheers and thanks so much for your interest. Fabulous pictures! Would love to visit this place! Oh, I hope you do. It’s fantastic. i love ur travel blog ! Wow, thanks so much. Love yours too. Beautiful photos of gorgeous majestic cats! Thanks so much. They are such amazing creatures. Wild dogs make an appearance in Pench National Park | Where to next? Leopards and their diminishing jungle | Where to next?